Summer never has to end with this fantastic flip flop graph drink sleeve. Designed to fit either a can or a glass with directions in sc and tunisian crochet. Designed by Creative Threads by Leah exclusively for Cre8tion Crochet. 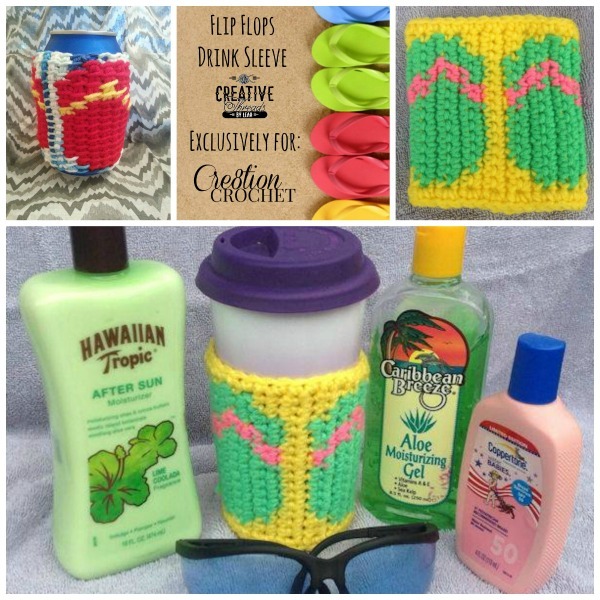 This awesome drink sleeve and flip flop graph were designed by Leah Feild of Creative Threads by Leah. Leah is one of Cre8tion Crochet’s featured contributors. I love summer and one of my favorite things about summer is flip flops! I can never wait until it is warm enough to wear them and only put them away when it is absolutely too cold to get away with wearing them longer. My husband has laughed at me because I have even paired toe socks with my flip flops to get a longer wearing season out of them. Another thing I love about summer is a big glass of sweet tea but I HATE having a sweaty glass. So I combined the two and designed this drink sleeve! And when the weather turns cold and I can’t wear my flip flops, I might just pull this sleeve out and put it on my coffee cup! I hope you enjoy this pattern as much as I enjoyed creating it. In single crochet, odd numbered graph rows will be worked right to left, and even numbered graph rows will be worked left to right. When working in Tunisian each row has a forward and return pass. All graph rows will be worked right to left. To finish off in Tunisian, sl st across the last row. There is a picture at the end of this pattern to show how I count my sts for Tunisian as it was brought to my attention that it is different. Can size finished measurement is approximately 8 inches in gauge. Cup size finished measurement is approximately 9.75 inches in gauge. Click HERE to continue on to this pattern on the Creative Threads by Leah Blog.